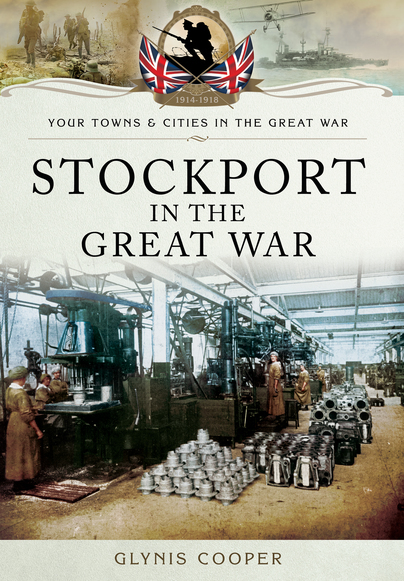 You'll be £9.99 closer to your next £10.00 credit when you purchase Stockport in the Great War. What's this? Interest in the theft of cucumbers initially took precedence over news that war had been declared, but Stockport rallied quickly. Wakes week was cancelled, the local 6th Battalion of the Cheshires went to the Front and the town transformed half of its schools into much-needed military hospitals. Admirably, the remaining schools coped with double the number of children but education suffered little. At the time, Stockport was two towns; the millscapes around the Mersey and the Goyt and the wealthier genteel suburbs bordering the Cheshire countryside. Economy and efficiency in the use of food and fuel was preached in the local paper alongside advertisements for silks, satins, velvets, furs and evening gowns. The cotton and hatting trades, transport and agriculture, suffered badly from loss of resources and manpower but resisted the use of female labour with great hostility. Food, fuel and lighting restrictions caused problems and there were accusations of profiteering and hoarding. This is a fabulous book for not only those that are interested in Stockport but those of us who love the history of the North West of England and its industrial and agrarian history. This book brings back the notion that all history is local, even wars on foreign fields and it is always fantastic to learn more about the area I know so well.